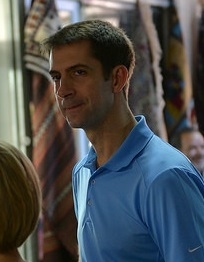 Sen. Tom Cotton, a Republican from Arkansas who served two combat tours in Iraq and Afghanistan, introduced legislation Tuesday that would delay the termination of the National Security Agency’s bulk metadata collection program until the Obama administration can certify that its proposed new architecture for keeping the data in private-sector hands will not have a negative impact on the government’s ability to detect terrorist plots. The proposed bill, known as the Liberty Through Strength Act, comes just days after the coordinated terrorist attacks across Paris and just 10 days before the mandatory transition of bulk metadata storage from NSA servers back to servers operated by private telephone companies. The transition was mandated by the USA Freedom Act, which passed in June. But the potential use of electronic communications by the Paris terrorists to plan and coordinate the attacks that killed 129 people has led to new questions about the Obama administration’s willingness to add another layer to the process of getting access to records of suspected terrorists and their supporters. The changes to the NSA metadata program under the USA Freedom Act are set to become effective Dec. 1. Cotton’s bill, however, would extend the transition timeline in the USA Freedom Act until after Jan. 31, 2017, and upon certification from the president that the new architecture will have no operational impacts. It would also make lone wolf and roving wiretap provisions of the USA Patriot Act permanent.